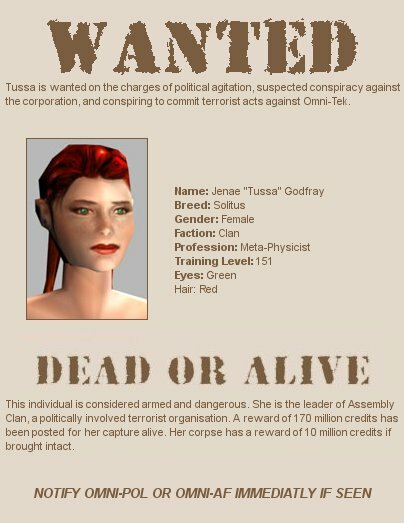 Early this morning, Omni-Pol and Omni-AF issued more arrest warrants, this time for Isobel "Ailish" Nottoris an Advisor from First Light Clan (wife of Commander "Caid" Nottoris), Clan Leader Jenae "Tussa" Godfray from Assembly Clan, Clan Leader Cathern "Vixentrox" Flowers from Whisper`s Edge Clan and a reminder of the outstanding arrest warrant for former Council of Truth Spokesman Henry Radiman! Apparently law enforcement departments have an agenda to hunt down those who are trying to reform a new Council of Truth at any cost. It is alarming that the corporation is willing to pay hundreds of millions to stop even a the possibility of a new Council being rebuilt. What is more obvious is that they are desperate to capture Mr. Radiman, whom most political analysts see as the key to reforming a new CoT. Without him the current effort to bring the clans to a united front will be much harder to accomplish, some would say close to impossible. 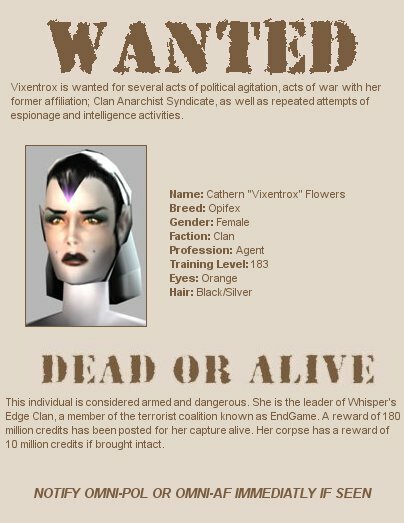 My sources have told me that criminals from all factions and corporate bounty hunters are looking to make a small fortune by cashing in the warrants. This could mean big trouble for the leaders and their organizations. 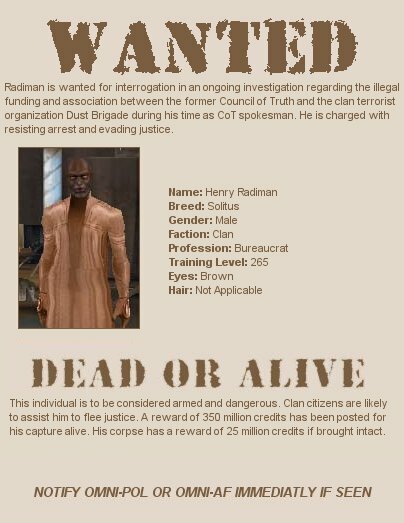 Now not only do they have to worry about convincing other clans to join the effort, now they have to watch their backs at all times and hope that Mr. Radiman is not taken into custody. The following are copies of the holo-posts that all OT Department Directors received today. How far will Omni-Tek go to stop the movement? warrants are going out like beer at the Happy Rebel. 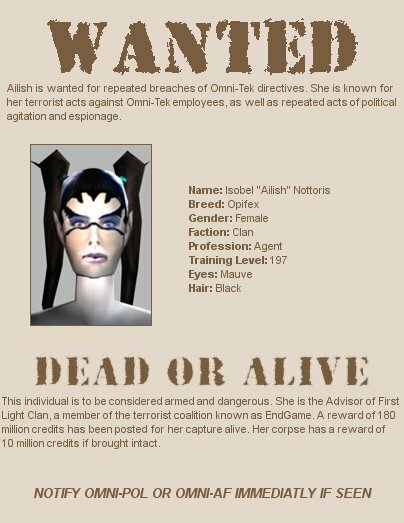 How will these 'wanted' men and women respond to these warrants? with words, or with force?